H. Richard Niebuhr’s Christ and Culture is one of the most significant theological and missiological works of the 20th century, offering a memorable categorization of the ways Christians have related to culture throughout history. When contemporary authors address the question of how a Christian relates to society, they either rename and refine Niebuhr’s categories (Tim Keller in Center Church), incorporate Niebuhr’s framework into a simpler one (James Davison Hunter in To Change the World), or provide strengths and weaknesses of Niebuhr’s proposal while reflecting on various applications (D. A. Carson in Christ and Culture Revisited). Occasionally, authors will reject the Niebuhrian project altogether for being too heavily influenced by a Christendom mentality (Stanley Hauerwas and William Willimon in Resident Aliens), but even then, the passionate counterpoint to Christ and Culture serves as a backhanded compliment, since it recognizes and reinforces the widespread influence this work has had. Niebuhr’s work begins with definitions. Who is Christ? He is the New Testament figure, crucified and raised from the dead, the One whom Christians accept as their authority (11-13). “Belief in him and loyalty to his cause involves men in the double movement from world to God and from God to world” (29). 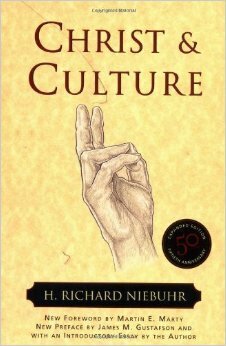 What is culture? It is the social life of humanity, the environment created by human beings in the areas of “language, habits, ideas, beliefs, customs, social organization, inherited artifacts, technical processes, and values” (32). and a combination that incorporates insights from both of these two views (Christ above culture). and a conversionist type that portrays Jesus as the converter of culture and society. The rest of the book lays out these five options. To exemplify the Christ against Culture position, Niebuhr claims Tertullian, Leo Tolstoy, the Mennonites, and various voices from the monastic tradition that are united by a common theme: loyalty to Christ and the church entails a rejection of culture and society. The lines between the church and the world are sharp because the church is a community whose existence judges the world. Niebuhr credits the impressive sincerity of adherents to this position, but he rejects it as inadequate for its inability to extricate itself from the culture it condemns. For the Christ of Culture position, Niebuhr points back to the ancient Gnostics, Abelard, Albrecht Ritschl, and a large swath of Protestant liberalism. The commonality here is a lack of tension between the church and the world, since Jesus is the fulfiller of society’s hopes and aspirations. He is “the great enlightener, the great teacher, the one who directs all men in culture to the attainment of wisdom, moral perfection, and peace” (92). Despite the appeal of this position the elite and powerful groups within a civilization, Niebuhr sees it as inadequate for allowing loyalty to culture trump loyalty to Christ, to the point the New Testament Jesus gets replaced with an idol that shares his name (110). The Christ above Culture position, according to Niebuhr, is the dominant voice of church history. The fundamental issue is between God and humanity, not God and the world. In the synthesis version, advocates do not choose between Christ and culture, but rely on “both Christ and culture” as God uses the best elements of culture to give people what they cannot achieve on their own. Church fathers like Justin Martyr and Clement of Alexandria are early examples. Thomas Aquinas is the supreme defender of this position, seen clearly in his effort to combine into one system the relationship between reason and revelation, creation and redemption, nature and grace. The downside to this view is the institutionalization of Christ and the gospel, as well as the tendency to absolutize what is relative, reduce the infinite to finite form, and materialize what is dynamic (145). The Christ and Culture in Paradox position is the dualistic version of “Christ above Culture:” the conflict between God and humanity is ever present and this conflict represents Christ and culture as well. “Grace is in God, and sin is in man,” Niebuhr writes (151), the basis for seeing human depravity that pervades and corrupts all human work and culture creation. Upholding the paradox of law and grace, divine wrath and mercy, the Christian lives between two magnetic poles. Niebuhr claims the apostle Paul as an early advocate of this approach, later represented by Martin Luther and Sören Kierkegaard. Though Niebuhr recognizes the power of this view because of the way it corresponds to our experience, he finds it inadequate for its tendency toward antinomianism or cultural conservatism (187). The Christ as Transformer of Culture position is the conversionist version of “Christ above Culture,” and it is most clearly presented in the work of Augustine, John Calvin, and F. D. Maurice. According to this view, all of culture is under the judgment of God, and yet culture is also under God’s sovereign rule. Therefore, “the Christian must carry on cultural work in obedience to the Lord” (191). Emphasizing the goodness of creation, the conversionist affirms what can be affirmed and seeks to transform what is corrupted by sin and selfishness. Eternal life begins in the present, Niebuhr writes, claiming the apostle John as a biblical advocate for this perspective. Christ and Culture ends with a postscript encouraging readers to not settle on one of these views to the exclusion of the others. No “Christian answer” exists that applies definitively for all time, since faith is “fragmentary,” and we do not have “the same fragments of faith” (236). Tomorrow, we’ll take a look at the strengths and weaknesses of Niebuhr’s taxonomy. For today, if you had to pick one of these five options, which one would you go with?